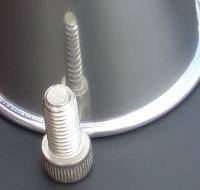 Very reflective like chrome plating, like very shiny silver color, the closest thing to chrome that we have seen. But make no mistake this is not chrome. Due to variances in computer monitors (such as color resolution, color temperature, etc. ), we cannot be responsible for any final selections in color. Recommended for differential covers and Rock Crushers. *We let you personalize your Spider Rock Guard as much as possible.